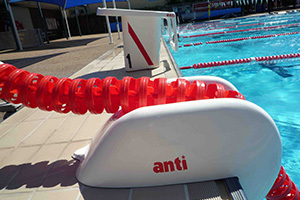 The Anti Wave Caddy Lane Saver provides for safe and quick removal of Anti Wave Swimming Lanes. The Caddy Lane Saver is designed to be quickly installed onto the pool deck and allows for smooth, unhindered movement of lane lines that would otherwise be damaged by the sharp pool edge, the perfect way to protect your Anti Wave Swimming Lanes from unnecessary damage. Click here to view the Caddy Lane Saver.